M2GATE (MENA-Michigan Initiative for Global Action Through Entrepreneurship) is a project-based, virtual-exchange program that teams students in Michigan with peers in the Middle East-North Africa (MENA) region to identify pressing social challenges and create and present entrepreneurial solutions. This Stevens Initiative supported program connects hundreds of undergraduate students in Egypt, Libya, Morocco, Tunisia, and Michigan (U.S.) to work on cross-cultural, virtual teams to develop business ideas that create social change. Among them are twins Abdalrahim and Joma Braika who live in Benghazi. Originally from Palestine, the brothers came to Libya seeking better educational opportunities. Throughout their schooling, the ambitious pair ran their own clothing delivery service. When they joined the M2GATE program, they expanded their entrepreneurial outlook to ventures “which have a social effect on our society,” says Joma. Their team, “The Eagles,” decided to focus its project on education in Libya – specifically, the lack of technology in learning. For the Braika brothers, the interest was personal: The prolonged Libyan civil war significantly damaged the country’s educational infrastructure. The M2GATE program was the brothers’ first exposure to educational technology. “It was really very amazing,” says Abdo. 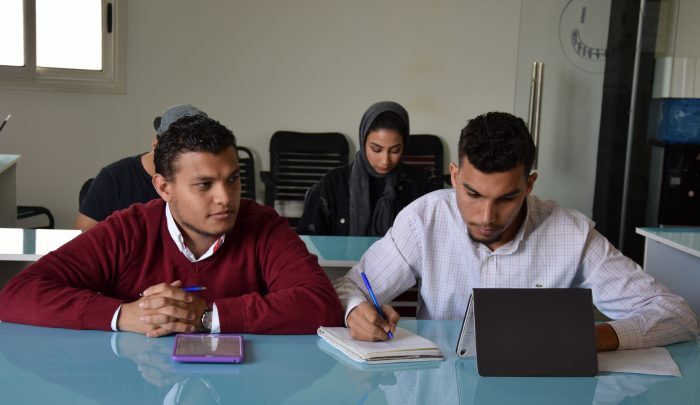 Over the eight-week program, with the guidance of the M2GATE online curriculum and their local mentor, team Eagles designed an app to facilitate learning technology in Libyan classrooms. Their ultimate goal is to make Libyan youth more employable. M2GATE not only provided the brothers a vision, but as Nagem notes, it also built their expertise and confidence. Abdo also credits the program with his improved teamwork and presentation abilities. And Joma cites new leadership abilities – such as a growth mindset and assuming the best of others’ intentions. For Joma and Abdo Braika, virtual exchange has created cross-cultural friendships, built workplace skills, and even propelled them in a new career direction. These are just a few of the impacts the M2GATE program is having in MENA and Michigan, where new relationships and new skills are leading to empower social action.